Engineers have begun the two-month process of cooling down a “doomsday vault”, which will house seeds from all known varieties of key food crops. The temperature inside the Svalbard Global Seed Vault will drop to -18C (0F) in order to preserve the seeds. 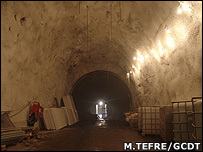 Built deep inside a mountain, it aims to safeguard the world’s crops from future disasters, such as nuclear wars, asteroids or dangerous climate change. The first seeds are scheduled to arrive at the Arctic site in mid-February. I still think its rather funny that, at least in the reports I have read, that the vault is mainly built under the assumption of global warming. However if the Greenland ice sheet falls and sinks northern europe into an ice age, Svalbard could end up under miles of ice… and its seed bank along with it.